This may seem like a distant number and it's certainly easy for us to get detached but let me remind you that just about every pension and investment fund in the world holds a large amount of US treasuries. So, we're all in this big boat together. Of course, with the high level of inflation over the last few decades, it's important to put this large round figure into a more tangible context. After all, 22 trillion is just a round number. A large round number but still rather arbitrary. 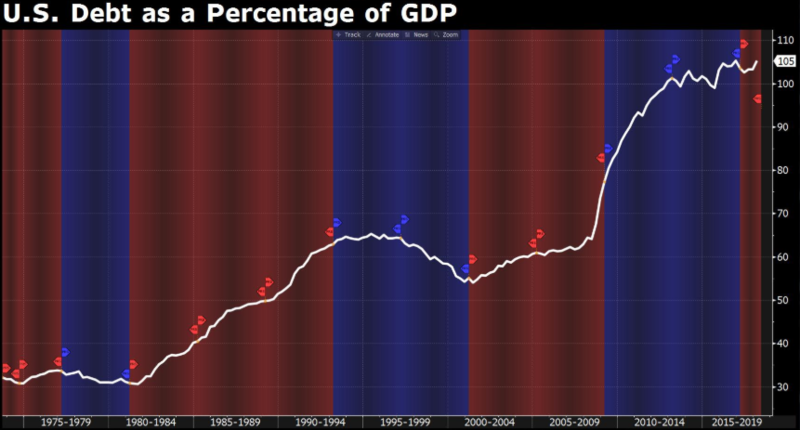 In the following graph, we can see American debt to GDP over the last 50 years. Bloomberg's Hilary Clark @queenofchartz who produced the graph has admitted that it is the scariest chart she's ever made. It's probably nothing to worry about though. As long as the United States is able to continue making the necessary payments on its debt, the global economy should remain stable. And to be fair, there are certainly other countries with far higher levels of debt. It's also been confirmed that President Xi himself will be meeting with US officials in Beijing on Friday to try and hammer out a deal. Guess that goes to show that alcohol and Brexit don't mix. In any case, the alleged conversation has May's Chief EU advisor Olly Robins saying that when it comes down to it, UK parliament will be given a choice between May's deal at the last minute or an extension from the EU to Article 50.